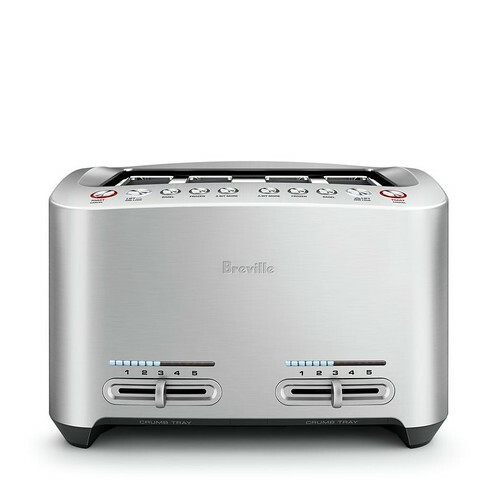 The Breville Die-Cast 4-Slice Smart Toaster™ — Easy and perfect toast every time. Dual action controls let you toast for two different tastes. Motorized one-touch technology. Mechanized lowering for gentler handling. Consumer research led designers to add A Bit More™ browning and the Auto Lift and Look™ features. 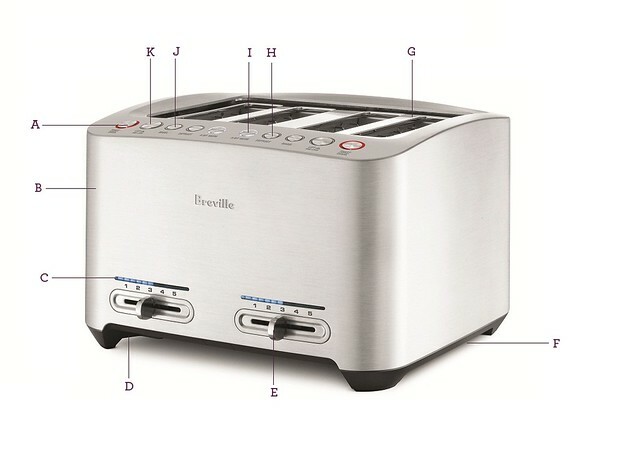 Bagel setting knows to toast only on the inside. Sleek, modern, brushed stainless steel in smooth lines accents your kitchen with style. Extra-wide slots for artisan breads, bagels, and pastries. Front pull-out crumb tray for no-lift cleaning. A. 'TOAST/CANCEL' Button. B. Brushed Die-Cast Body. C. LED Toasting Progress Indicator. D. Slide-Out Crumb Tray. E. Variable Browning Control Slide. F. Cord Storage. G. Intelligent Auto-Lowering 1.5"(W) x 5.5"(H) Slots with Self Centering Carriage. H. 'DEFROST' Button. I. 'A Bit More'™ Button. J. 'BAGEL' Button. K. Auto 'Lift & Look'™ Button. Not Shown Breville Assist™ Plug.